Golf is a sport in which individual players or teams of players strike a ball into a hole using several types of clubs. It is one of the few ball games that does not use a fixed, standardized playing field or area. Although similar games can be traced back to the Chinese and Dutch, modern golf is considered to be a Scottish invention. The Rules of Golf are internationally standardized and are jointly overseen by the Royal and Ancient Golf Club of St. Andrews (R&A) and the United States Golf Association (USGA). The underlying principle governing play is fairness, which is explained on the back cover of the official rule book: "play the ball as it lies," "play the course as you find it," and "if you can't do either, do what is fair." There are at least 20 professional golf tours with the most widely known being the Professional Golfers Association (PGA) Tour, which attracts the best golfers from all the other men's tours, due to the fact that most PGA Tour events have first prizes of at least US$800,000. The four most prestigious annual men's tournaments are: The Masters, U.S. Open, The Open Championship (referred to in North America as the British Open), and the PGA Championship. Women's golf does not have a globally agreed upon set of majors, while the list of senior majors on the U.S.-based Champions Tour now recognizes five annual majors. The popularity of golf has grown rapidly, with an estimated 35,000 golf courses in the world, approximately half of them in the United States. After a 112-year absence from the Olympic games, golf made its comeback for the 2016 Rio Games. Golf is a very old game of which the exact origins are unclear. The term golf derives from the Dutch word kolf or kolve, literally meaning club. In the Scottish dialect of the late fourteenth or early fifteenth century, the Dutch term became goff or gouff, and only later in the sixteenth century, golf. The linguistic connections to the Dutch and Scottish terms came about due to the very active trade taking place between the Dutch ports and Scottish east-coast ports, from the fourteenth through seventeenth centuries. Ming Emperor Xuande possibly playing golf. A game somewhat similar to golf was first mentioned in Dōngxuān Records, a Chinese book of the eleventh century C.E. In the Netherlands, the Dutch played a golf-like game with a stick and leather ball, recorded as far back as 1297. The winner of this game was whoever hit the ball into a target several hundred feet away the most number of times. Some scholars suggest that the Dutch game of kolf was brought by Dutch sailors to the east coast of Scotland, where it was transferred on to the public linkslands (coastal parks) and eventually became the game known today. Modern golf is considered to be a Scottish invention, ironically because the game was mentioned in two fifteenth-century laws prohibiting the playing of the game. However, some scholars have suggested that this refers to another game that is more akin to modern shinty, hurling, or field hockey. Various courses vie for the honor of being the oldest. The first game of golf for which records survive was played at Bruntsfield Links, in Edinburgh, Scotland, in 1456 C.E., recorded in the archives of the Edinburgh Burgess Golfing Society, now the Royal Burgess Golfing Society. The oldest existing golf course in the world is the Old Links at Musselburgh Racecourse in Musselburgh, East Lothian, Scotland, with evidence showing that golf was played on Musselburgh Links in 1672. Mary, Queen of Scots reputedly played there in 1567. Golf courses have not always had 18 holes. As early as the fifteenth century, golfers at St. Andrews, in Fife, reportedly established a customary route through the undulating terrain, playing to holes whose locations were dictated by topography. The St. Andrews Links occupy a narrow strip of land along the sea, and so the course that emerged featured 11 holes, laid out end to end from the clubhouse to the far end of the property. Golfers played the holes out, turned around, and played the holes in, for a total of 22 holes. In 1764, several of the holes were deemed too short, and were therefore combined. The number was thereby reduced from 11 to nine, so that a complete round of the links comprised 18 holes. In 2005 Golf Digest calculated that there were nearly 32,000 golf courses in the world, approximately half of them in the United States. The countries with the most golf courses in relation to population, starting with the best endowed were: Scotland, New Zealand, Australia, the Republic of Ireland, Northern Ireland, Canada, Wales, the United States, Sweden, and England (countries with fewer than 500,000 people were excluded). Apart from Sweden, all of these countries have English as the majority language, but the number of courses in new territories is increasing rapidly. 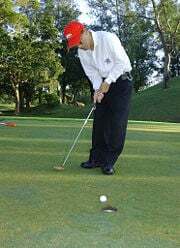 For example, the first golf course in the People's Republic of China only opened in the mid-1980s, but by 2005 there were 200 courses in that country. The professional sport was initially dominated by British golfers, but since World War I, America has produced the greatest quantity of leading professionals. Other Commonwealth countries such as Australia and South Africa are also traditional powers in the sport. Since the 1970s, Japan, Scandinavia, and other Western European countries have produced leading players on a regular basis. The number of countries with high-class professionals continues to increase steadily, especially in East Asia. South Korea is notably strong in women's golf. There has been a marked increase in specialized golf vacations or holidays worldwide. This demand for travel centered on golf has led to the development of many luxury resorts that cater to golfers and feature integrated golf courses. Golf is played in an area of land designated "the course." The course consists of a series of "holes"—"hole" or "cup" meaning both the pit in the ground to which the ball is played and the distance from the "tee" to the "green" (the low-cut grass surrounding the hole). Most golf courses consist of 18 holes. After his first shot—called teeing off—the player again hits the ball to the green from where it came to rest, either from the "fairway" or from the "rough." Exceptions are short par-three holes, where the second shot may lie directly on the putting green, or in the rough. Playing the ball from the fairway is advantageous, because fairway grass is very short and even, allowing the player to strike the ball cleanly, while playing from the rough is disadvantageous, because the grass in the rough is generally much longer, which may affect the ability to strike the ball well, as well as the flight of the ball immediately after being struck. While many holes are designed in a straight line from the tee-off point to the green, some holes may bend either to the left or to the right. This is called a "dogleg," in reference to the bend of a dog's knee. Special rules apply to playing balls that fall in a hazard. For example, a player must not touch the ground with his club before playing a ball, not even for a practice swing. A ball in any hazard may be played as it lies without penalty. If it cannot be played from the hazard, the ball may be hit from another location, generally with a penalty of one stroke. Strict rules govern exactly from where the ball may be played outside a hazard. A golfer sinks his putt. To "putt" is to play a stroke using the flat-faced "putter" club. Usually, this stroke is played on the green where the ball does not leave the ground. Once on the green, the ball is putted toward the hole until the ball falls into the cup. The grass of the "putting green" (more commonly simply the "green") is cut very short so that a ball can roll smoothly over relatively long distances. The slope, or "break," of the green affects the roll of the ball, sometimes dramatically. The growth direction of the blades of grass, called the "grain," also affects the roll somewhat. The cup is always found within the green, normally at least ten feet from its edge, and must have a diameter of 4.25 inches and a depth of at least 3.94 inches. Its position on the green is not fixed and may be changed from day to day. The cup usually has a flag on a pole positioned in it so that it may be seen from a distance; this flag-and-pole combination is called the "pin." Putting greens are not all of the same quality. Generally, the finest-quality greens are well kept so that a ball will smoothly roll over the closely mowed grass. Golfers describe a green as "fast" if a light stroke makes the ball roll a long distance. Conversely, a “slow” green is one where a stronger stroke is required to roll the ball the required distance. 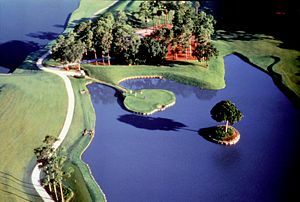 The famous 17th hole of the TPC at Sawgrass Stadium Course features an island green. A hole is classified by its par, the number of strokes a skilled golfer should require to complete play to the hole. For example, a skilled golfer expects to reach the green on a par-four hole in two strokes, one from the tee (the "drive") and another stroke to the green (the "approach"), followed by two putts. 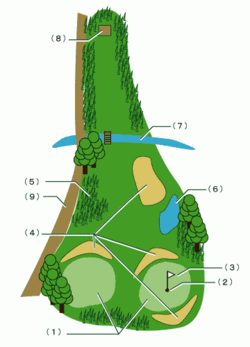 Traditionally, a golf hole is either a par-three, -four or -five. The par of a hole is usually, but not always, determined by the tee-to-green distance. A typical length for a par-three hole ranges between 100 to 250 yards; for a par-four hole, between 251 to 475 yards. Par-five holes are normally between 476 to 690 yards. These ranges are not absolute, however. It is possible that a 500-yard hole could be classed as a par-four hole, since the par for a hole is determined by its "effective playing length." If the tee-to-green distance on a hole is predominantly downhill, it will play shorter than its physical length and may be given a lower par rating. Conversely, a water hazard may cause players to hit short shots on their drives, making a 400-yard hole into a par-five. Many 18-hole courses have approximately four par-three, ten par-four, and four par-five holes, for a total par of 72 for a round. The par-scoring system can be seen as a way to facilitate the comparison of all golfers' progress around the course in stroke play by providing a common reference score. Players walk (or drive in motorized carts) over the course, either singly or in groups of two, three, or four, sometimes accompanied by caddies who carry and manage the players' equipment and give them advice. When all individual players or teams have brought a ball into play, the player whose ball is the farthest from the hole is next to play. When all players of a group have completed the hole, the player with the best score on that hole has the "honor," that is, the right to tee off first on the next tee. In match play, two players play every hole as a separate contest against each other. The party with the lower score wins that hole, or if the scores are equal the hole is "halved" (drawn). The game is won by the party that wins more holes than the other. In the case that one team has taken a lead that cannot be overcome in the number of holes remaining to be played, the match is deemed to be won by the party in the lead, and the remainder of the holes are not played. When the game is tied after the predetermined number of holes have been played, it may be continued until one player takes a one-hole lead and thus wins the match. In stroke play, every player counts the number of shots taken for the whole round or tournament to produce the total score, and the player with the lowest score wins. A variant of stroke play is Stableford scoring. There are many variations of these basic principles, some of which are explicitly described in the Rules of Golf and are therefore regarded "official." Official forms of play are, among others, "foursome" and "four-ball" games. Golf can involve several types of team play. A foursome—not to be confused with a "foursome" of individual players—is played between two teams of two players each, in which each team has only one ball and players alternate playing it. A four-ball is also played between two teams of two players each, but every player plays his own ball. For each team, the lower score on each hole is counted. Four-ball can be played as match play or stroke play. There are also popular unofficial variations on team play. In a scramble the players decide which shot was best after teeing off. Every player then plays his second shot from within a clublength of where the best ball has come to rest, and the procedure is repeated until the hole is finished. In a "Texas scramble," the same rules apply, but at least four drives of each member of the team must be used during the course of the round. In "best ball," each player proceeds through the hole as normal, but the lowest score of all the players on the team counts as the team's score. "Best ball" can also be an alternative name for a scramble, as can "captain's choice," in which case it is a nominated captain rather than the team collective who decides which ball is best. In a greensome, two players tee off, and then pick the best shot as in a scramble. The player who did not shoot the best first shot plays the second shot. The play then alternates as in a foursome. Several variants of the above are also played. A handicap is a numerical measure of an amateur golfer's ability to play golf over 18 holes. In stroke play, the difference between one's average number of strokes per round and the par of that course determines one's handicap. The Rules of Golf are internationally standardized and are jointly governed by the Royal and Ancient Golf Club of St. Andrews (R&A), which was founded in 1754, and the United States Golf Association (USGA). By agreement with the R&A, USGA jurisdiction on the enforcement and interpretation of the rules is limited to the United States and Mexico. The national golf associations of other countries use the rules laid down by the R&A and there is a formal procedure for referring any points of doubt to the R&A. In addition to the officially printed rules, golfers also abide by a set of guidelines called golf etiquette. Etiquette guidelines cover matters such as safety, fairness, pace of play, courtesy to other players, and the obligation to contribute to the care of the course. A "wood" (left) is used for long drives, while an iron (right) is used for medium-length drives and approach shots, and the putter (center) is normally used on the green. To hit the ball, the club is swung at the motionless ball on the ground (or wherever it has come to rest) from a side stance. Every shot is a compromise between length and precision, as long shots are generally less precise than short ones. Obviously, a longer shot may result in a better score if it helps reduce the total number of strokes for a given hole, but the benefit may be more than outweighed by additional strokes or penalties if a ball is lost, out of bounds, or comes to rest on difficult ground. Therefore, a golfer must assess the goal of their shots in each situation, in order to judge whether the possible benefits of aggressive play are worth the risks. There are several possible causes of poor shots, such as poor alignment of the club, wrong direction of the swing, and off-center hits where the club head rotates around the ball at impact. Many of these troubles are aggravated with the "longer" clubs and higher speed of swing. Furthermore, the absolute effect of a deviation will increase with a longer shot compared with a short one. A wide range of equipment exists for playing golf, ranging from golf clubs, balls, tees, gloves, and shoes. As golf has grown more competitive, players have wanted equipment that performs better. Golf balls have changed from feather-filled leather sacs to complex composites. 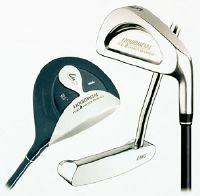 Golf clubs have changed from wooden shafts and club heads to carbon fiber shafts and precisely engineered club heads. A full swing is a complex rotation of the body aimed at accelerating the club head to a great speed. For a right-handed golfer, it consists of a "backswing" to the right, a "downswing" to the left to strike the ball, and a "follow-through." At "address," the player stands with the left shoulder and hip pointing in the intended direction of ball flight, with the ball before the feet. The club is held with both hands (right below left for right-handed players), the club head resting on the ground behind the ball, hips and knees somewhat flexed, and the arms hanging from the shoulders. The backswing is a rotation to the right, consisting of a shifting of the player's body weight to the right side, a turning of the pelvis and shoulders, lifting of the arms and flexing of the elbows and wrists. At the end of the backswing the hands are above the right shoulder, with the club pointing more or less in the intended direction of ball flight. The downswing is roughly a backswing reversed. After the ball is hit, the follow-through stage consists of a continued rotation to the left. At the end of the swing, the weight has shifted almost entirely to the left foot, the body is fully turned to the left and the hands are above the left shoulder with the club hanging down over the player’s back. 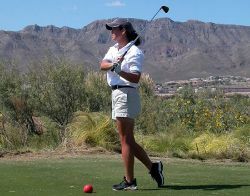 A golfer completes her follow-through. The full golf swing is an unnatural, highly complex motion and notoriously difficult to learn. It is not uncommon for beginners to spend several months practicing the basics before playing their first ball on a course. It is usually very difficult to acquire a stable and successful swing without professional instruction and even highly skilled golfers may continue to take golf lessons for many years. A golf ball acquires spin when it is hit. "Backspin" is imparted for almost every shot except putting, due to the golf club's "loft" (i.e., angle between the clubface and a vertical plane). A spinning ball deforms the flow of air around it similar to an airplane wing, and a back-spinning ball therefore experiences an upward force which makes it fly higher and longer than a ball without spin. The amount of backspin also influences the behavior of a ball when it impacts the ground. A ball with little backspin will usually roll out for a few yards while a ball with more backspin may not roll at all, or even roll backwards. "Sidespin" occurs when the clubface is not aligned perpendicularly to the plane of swing. Sidespin makes the ball curve left or right: a curve to the left is a "draw," and to the right is a "fade" (for right-handed players). Accomplished golfers purposely use sidespin to steer their ball around obstacles or towards the safe side of fairways and greens. But because it is sometimes difficult to control or predict the amount of sidespin, balls may take an undesirable trajectory, such as "hook" to the left, or a "slice" to the right. The mental aspect of golf contributes to the difficulty of the golf swing. Golfers play against the course, not each other directly; and they hit a stationary object, not one put into motion by an opponent. This means that there is no one to blame but oneself for a bad result, and in most competitive formats there are no teammates. This situation can create psychological pressure on the golfer at all levels of play. Even the best professional golfers sometimes succumb to this pressure, such as getting the "yips," a severe putting disorder caused by uncontrolled muscle spasms of the arms, resulting in a jerking motion during the follow through of the putt causing the ball to go much farther than desired, or having collapses of their full swing. Pressure or lack of concentration can also create minor deviations in one's swing, resulting in serious "hooks" or "slices." Golf has often been in the forefront of technological advances in sport. Systems have been developed that measure the speed and spin of golf balls after they are hit, measure club head speed, and even how the body moves during the golf swing. Video motion capture has played a large role in measuring aspects of golf that are difficult if not impossible to measure and understand with the human eye. Tools such as launch monitors are able to measure club head speed as well as golf ball speed and spin, projecting the most likely flight path of the ball. Video capture devices allow body position and angles to be determined at different points of the swing. Movement-detection devices allow for the most information to be gathered at one time, measuring position, angles, and orientations, as well as velocities at many points of the swing. The benefit of movement-detection devices is that they utilize computers, which can to store data more economically than high speed video and are more precise. Technology has also contributed to major advances in golf balls and golf clubs, resulting in longer and straighter shots. These advances have been significant enough so that many courses have lengthened their holes—especially their par-fives—in order to create an adequate challenge to contemporary players. Golf is played professionally in many countries. The majority of professional golfers work as "club pros" or teaching professionals and compete only in local competitions. The elite of professional golfers are "tournament pros" who compete full time on international tours. 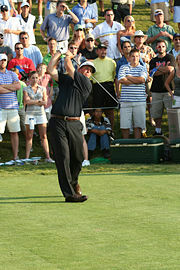 Phil Mickelson tees off at the Tournament Players Championship 2007. There are at least 20 professional golf tours, each run by a PGA or an independent tour organization, which is responsible for arranging events, finding sponsors, and regulating the tour. Typically a tour has "members" who are entitled to compete in most of its events, and also invites non-members to compete in some of them. Gaining membership of an elite tour is highly competitive, and most professional golfers never achieve it. 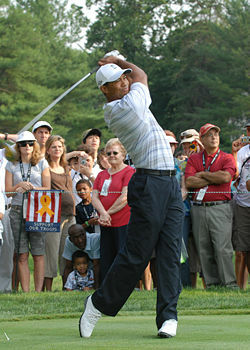 The most widely known tour is the PGA Tour, which attracts the best golfers from all the other men's tours. This is due mostly to the fact that most PGA Tour events have a first prize of at least US$800,000. The European Tour, which attracts a substantial number of top golfers from outside North America, ranks second to the PGA Tour in worldwide prestige. Some top professionals from outside North America maintain memberships on both the PGA Tour and the European Tour. The next echelon on the American circuit is the Nationwide Tour. Golfers at the lower echelons compete intensely to gain slots on the major tours, where big money is more likely to be won. There are five principal tours for women, each based in a different country or continent. The most prestigious of these is the U.S.-based LPGA Tour. The fields for these events include the top several dozen golfers from all over the world. The Masters has been played at Augusta National Golf Club in Augusta, Georgia since its inception in 1934. It is the only major championship that is played at the same course each year. The U.S. Open and PGA Championship are played at various courses around the United States, while The Open Championship is played at various courses in the United Kingdom. The number of major championships a player accumulates in his career has a very large impact on his stature in the sport. Jack Nicklaus is widely regarded as the greatest retired golfer of all time, largely because he has won a record 18 professional majors, or 20 majors in total if his two U.S. Amateurs are included. Tiger Woods—the one golfer in the foreseeable future likely to challenge Nicklaus's record—had won 13 professional majors (16 total if his three U.S. Amateurs are included) before the age of 31. Of these five events, the Senior PGA Championship is by far the oldest, having been founded in 1937. The other events all date from the 1980s, when senior golf became a commercial success as the first golf stars of the television era, such as Arnold Palmer and Gary Player, reached the relevant age. 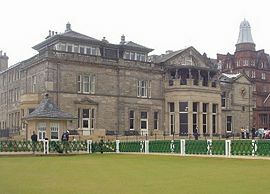 The Senior British Open was not recognized as a major by the Champions Tour until 2003. Official site of the PGA of America. This page was last modified on 23 February 2019, at 16:39.